Wow, I feel like I have been gone from this space for ages and it's really only been, what, three weeks? What a crazy, busy, fun-packed time of year. We've gone straight from Christmas and New Year's to having my mom visit from Canada until the end of the month so it's been excursion central around here and we're all loving it. I'm struggling to get fully back into work mode but have kicked myself into gear a bit this week and got some printing done and orders out the door. The shop is looking a week bit bare but I have a few new goodies to add over the next couple of days and a fabric sale starting January 15, running for the last two weeks of the month (stay tuned for details on the 15th). I'm going to be concentrating mainly on fabric and quilting this year and the tea towels, totes and the other assorted bits I create will only be available when I do a market (and online after each market, stock depending). That's the plan anyway, we'll see what evolves as the year goes on. 2012 was such a great year for me and my family, I am so excited to see what 2013 brings! Those fabrics look lovely. I love yellow and grey together. 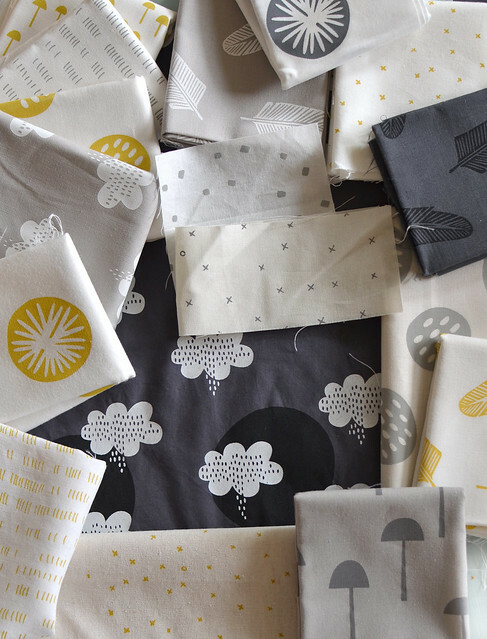 Will keep my eye out for your next handprinted fabric swap! Looking forward to the sale and the printed fabric swap! Fabric sale? Exciting! I can't wait to see your new designs too. exciting stuff, roll on the next fabric swap! Wow! This is too beautiful!